In Japan, we just had a second Teawase-kai; SJT brushing-up workgroup session yesterday. Teawase literally means matching or joining hands together. This word is often used in the martial arts sphere, when two or more people meet up and compare each other's skill. So, just like the martial arts, many Shakuju therapy practitioners, regardless of his or her skill and experience, gathered together. They were divided into three people groups, one person treats, another is a patient, and the third person is the watcher. Actually, this third one is the key person. When the therapist marks Shaku and Back-shu points, he/she always have to ask the third guy for check. Except those, everything is depended on its group. So, for some groups, the practitioner and the watcher are checking and arguing each step and various reference points, but for other groups, the treatment session is just like a normal treatment, observed by the third acupuncturist. Imagine, your each procedure is watched... yes, it is a good pressure. In the clinical practice, an acupuncturist has to face the patient alone. Acupuncturists are prone to be self-satisfied sometimes. To avoid this, it is a good opportunity to meet up other acupuncturists who have the same interests, same passion in common (please read Therapist's principles 6). Yes, Shakuju Therapy Workshop in Hawaii is going to be held this weekend!! 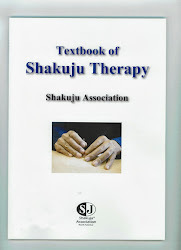 We are looking forward meeting everybody who are interested in Shakuju Therapy!!! Aloha!